Can you preserve a family business even though the principals are dissolving their marriage? While it can be a challenge to dissolve a marriage and preserve a family business, it can be done and often is in the best interest of not only the parties but the employees, suppliers, and patrons of the business. There are a number of ways this can be handled in a cooperative manner. As a first step, the value of the business must be determined. As with a family home, it is difficult to find a resolution when the value is not known. It is well worth hiring someone to give an opinion of value on the business. The expense of a business valuator can be mitigated by the amount you cooperate in providing information. Also, if you let the evaluator know that you are not planning to litigate the matter, the amount of supporting documentation can be minimized. A business evaluator can also let you know what standards are used in different industries. Do not make the assumption that because you are the only one working the business that it has no value without you. We once worked with a person who owned a boat washing business. The couple was ready to make an agreement based on no value to the business. A business valuator found the business to be worth $35,000 — substantial enough to make a difference in the negotiations. Will just one of the partners continue running the business or will both be involved? Either scenario can work but the lines must be carefully drawn. If one party is to continue to run the business it is expected that the business will provide revenue to that party and a determination can be made to pay spousal maintenance on that. If the spouse is receiving payments on her/his share of the business, those payments would be deducted from the operating parties income. There are tax implications either way that should be carefully considered. Example: A woman agreed to take monthly payments as buy out from her husband’s professional services business. 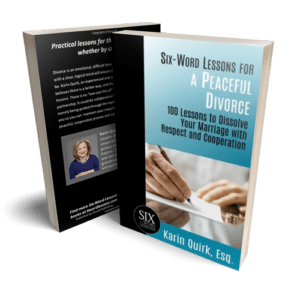 The divorce decree called the payments spousal maintenance and she later found out subjected her to significant tax obligations. It is crucial to label the payments correctly. Some couples can be reasonable and actually complementary business partners even though they don’t choose to continue their marital relationship. The parties should be sure to form an operating agreement or legal entity to own the business. While your divorce lawyer can be very helpful in the property division and the determination of support amounts, it is best to work with a business attorney to set up the business structure. A working agreement is essential to successfully continue the business. Example: We helped a couple who owned a home contracting business. He was excellent at the construction work and she was a great manager and bookkeeper. The two were able to successfully run the business together as they each brought their particular skills to the table. The legal documents were written as if they were for two unrelated business partners. This can be tricky but again, proper documents can avoid problems. Sometimes one of the spouses is a silent partner — receiving benefits from the business but having no controlling interest. Other times, both partners are voting members. A business attorney is essential in setting up the rules. Example: Husband was the only one of the couple working in a business but he had several partners. A special class of ownership was set up for the wife so that she would receive a share of profits and ultimately a share of the proceeds of the sale of the business but she had no authority in the day to day management of the business. Because of her cooperation, the business was not affected by the divorce and ultimately sold at a premium. By working cooperatively, a couple can avoid the pitfalls of a contentious, litigated divorce which can destroy a business or at least, reduce the value. All financial disclosure can be handled informally and discreetly and the final property settlement agreement can be a private contract not placed in the public record by filing with the court. A contentious divorce can affect not only the productivity of the principals but also create a tense environment affecting the productivity of all the employees. Certainly patrons of the business should be completely unaware there is a private legal proceeding between the owners. A cooperative divorce can minimize the impact on a family business, preserve everyone’s privacy and minimize stress and emotional trauma.